We are here to help you! Please contact us at [email protected] and we’ll get back to you as soon as we can. Sure, once your order has been shipped you will receive a tracking number via email and will be able to track the package. Delivery times are estimated, it can take longer than expected due to customs clearance procedures in certain countries. What should I do if my initial setup fails? 2) WiFi name and password have to be up to 22 characters length each. 3) Moodo is compatible with 802.11 b/g/n only. 4) Router security modes are OFF, like “intrusion detection” etc. 5) No MAC address filtering enabled in your router, and if it’s enabled, please whitelist Moodo’s MAC address, which is the last part of its serial number. How do I change the WiFi network that the Moodo device is connected to? Go to https://connect.moodo.co and follow the instructions about how to connect a Moodo to a WiFi network. How do I control multiple Moodo device from a single phone, without creating multiple accounts? Setup your first Moodo normally. How can multiple users control the same Moodo? Is there a Moodo API available for developers? Mesh networks are officially not supported. Is there any workaround? Complete the setup wizard and check your Moodo device responds to your commands on the 2nd smart phone. 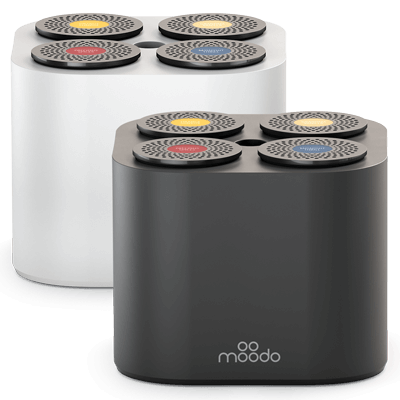 Moodo® is a smart home scent diffuser that allows users to mix and create thousands of their own signature scents. A user picks from a variety of “Scent Families”, each containing a different set of four base scent capsules, and personalizes the fragrance that Moodo creates by changing the mix of these four base scents in real-time. The contribution of each of the four base scents to the overall fragrance can be adjusted via a companion smartphone app, Amazon Alexa, Google home or manually on the device. There are currently 20 Moodo base scent capsules which can be mixed with each other at any proportion, creating hundreds of thousands of possible scent varieties to explore and save. What are the scent capsules, and how do they work? Scent capsules are organized into four-packs called Scent Families, each of which was curated by leading French perfumers. Families include Beach Party, Cozzzy etc. 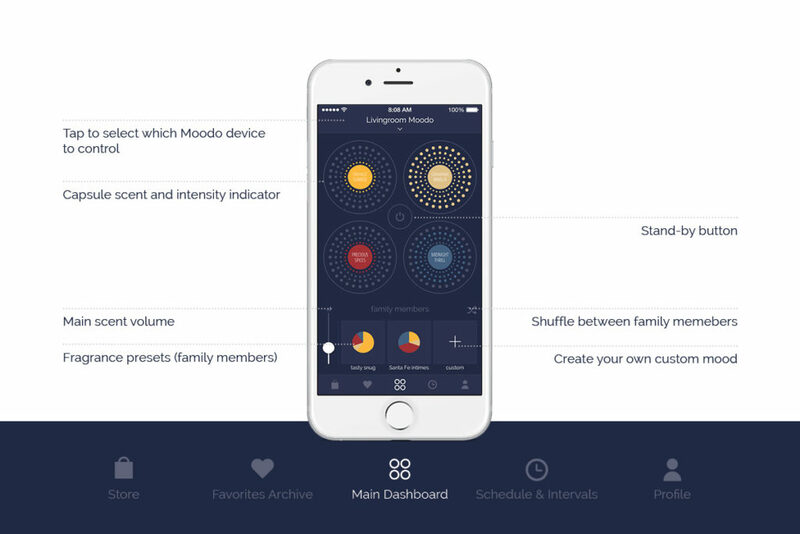 The Moodo smartphone app recognizes which scent family is in the device at a given time, and suggests preset scent mixes for the user to choose from. The capsules are filled with scent-infused beads, and don’t require any manual mixing or pouring. Capsules last around two months, or 60 hours of continual use. Moodo diffuses scent throughout a 600-sqft room without any wax, aerosol residue or mess to clean up. How do I know when any capsule needs to be replaced? When your Moodo device detects your capsule has reached its non-optimal fragrance level, you will get push notification to your mobile phone. Once users download the Moodo app, they can mix and match Moodo’s unique scents by adjusting the scent volume on the “Mixing” screen according to personal preference. Alternatively, users can select from a number of suggested presets corresponding to the Scent Family currently in the device. Since Moodo is Wi-Fi enabled, you can control it remotely from anywhere. 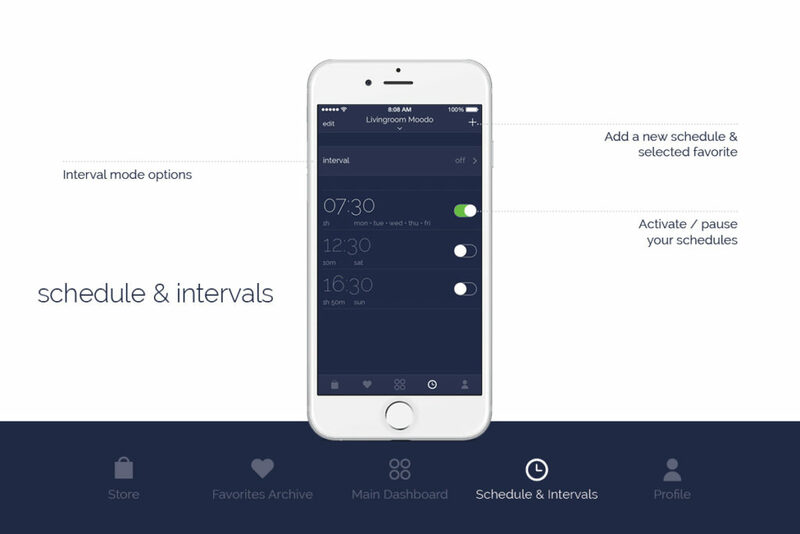 The app is available to download for free for iOS and Android. What is the shuffle feature? 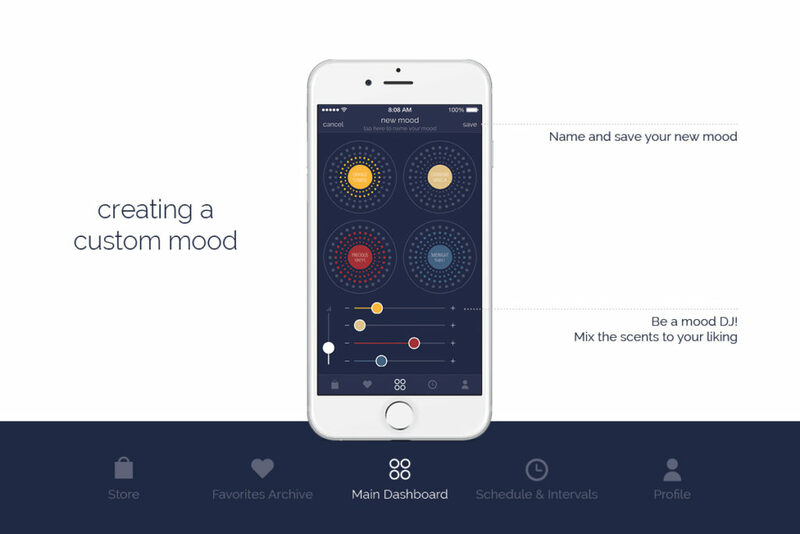 This new Moodo app feature automatically adjusts the levels of the four scent capsules every so often. This is done so that the scent keeps changing periodically, and users never become smell-desensitized, or “nose blind”. Tap the icon on the right hand side of the screen. Moodo will shuffle between the Family Members. How do I save the current scent mix? Tap the “Save” button on the top right hand corner of the screen. You can share your personal scent mix with others Moodo users by going to the Favorites Archive screen and clicking “Share”.